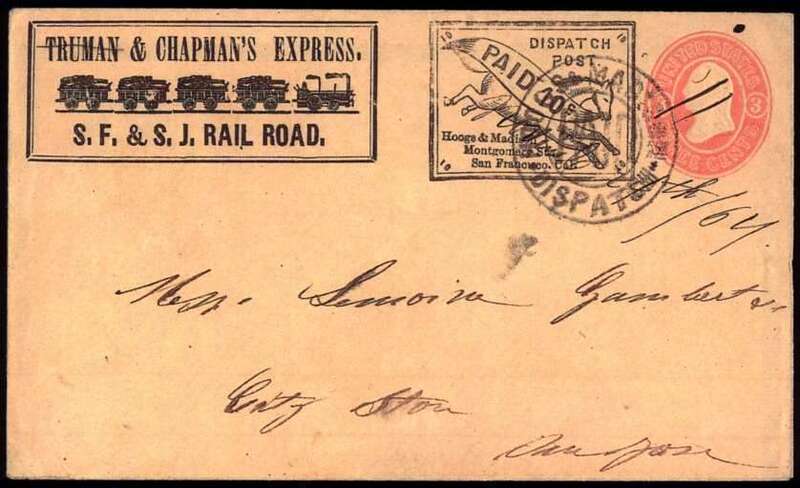 When I first published my pages on Trains on U.S. Stamps, I skipped the locals and expresses. I owned a few reproductions of the more common ones - the Broadway, Wyman's, Bronson & Forbes, and Pomeroy - but I had filed them with my train cinderellas, in keeping with my attitude that they were of no special value or interest philatelically. The ATA World Railways Philatelic handbook listed none of them at that time, and even its latest edition, a major revision published in 1999, lists only the Bigelow's, Broadway, and Wyman. So what the heck ARE Locals and Expresses, and why have they been shunned this way? Click on any image to see a higher-resolution version. To view the credits for any scan, let your mouse arrow rest on top of the image on your screen - a text box should pop up.